All people are intuitive. Every one of us possesses a small, still voice that serves as an internal moral compass. Crystals can help put is more closely in touch with this critical component of our true selves. Wearing, carrying, or meditating with crystals subtly but profoundly impacts our energy, our health, and our auras. 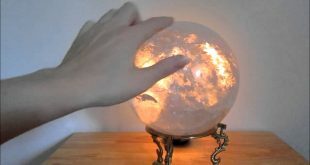 Crystals are used in clocks and computers, and they can be just as instrumental in our intuitive lives. There are six areas in which crystals can improve your life: physical, financial, romantic, professional, emotional, and energetic. Let’s explore each of those areas. 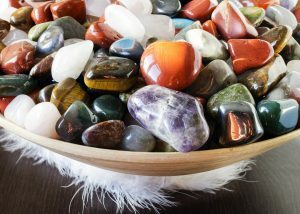 Crystals have healing properties and can help restore our organs and cells to function optimally. Red crystals like bloodstone and jasper help alleviate blood disorders. Yellow or orange crystals like carnelian, amber, and citrine ease stomach issues. Green stones like peridot and green aventurine work to heal and to help your cells grow. Light blue crystals such as blue chalcedony and blue lace agate heal throat issues. Amethyst helps with headache recovery. Unikite can help women conceive, while blue chalcedony can help new mothers. Each of these stones can link with and align your energy if worn at all times. Crystals can work to increase your financial abundance. If you want to attract money, keep citrine and green aventurine with you. Carrying a pyrite crystal in your wallet will encourage it to contain money. If you experience difficulties when it comes to holding on to money, wearing citrine will strengthen your frugality. If you own a business, keep a citrine crystal in your cash register. This will assure that more money enters than leaves. Green aventurine can be carried or worn for good luck. Gem trees will remind you that good fortune and good luck are within your reach and accessible. Many crystals can have positive effects on your romantic life. Generally, pink stones increase romantic energies. If you’re single and seeking true love, place two rose quartz crystals next to your bed to help love find you. If you’re in a romantic relationship, place a citrine cluster next to an amethyst cluster. Crystal clusters help people get along better with each other. Citrine crystals increase our confidence in relationships, while amethyst crystals help us feel more loving and agreeable toward others. Wearing watermelon tourmaline crystals will increase your confidence and help you feel worthy of good relationships. Pink calcite can help calm raging emotions in heated situations. Place garnet or rose quartz crystals under your bed to help increase the passion and romance up above. If you feel stuck in your job or career, set a large garnet crystal in your workspace to rekindle your passion. If you’re getting blocked as you work toward a goal, place a bloodstone paperweight in your workspace. Bloodstone will remove the obstacles that are standing between you and your success. Serpentine help people deal with changes like new jobs, promotions, or layoffs. A jade crystal tree with green and red stones will help draw more clients, money, positive work, and passion to your company and to you. As noted above, crystal clusters help groups get along better. Clusters of clear quartz crystals will help energize teams. Our progress in life is often impeded by an inability to forgive others or ourselves. Crystals can help break down common obstacles to forgiveness, like sadness, resentment, and anger. Rhodonite, with its lovely black and pink marbling, can help us embrace an angry or sad situation and to lovingly release it. Rhodochrosite, with its ribbons of white and pink, helps stir our hearts to surrender and to let go. Smithsonite can help bring healing to painful childhood memories, while malachite helps people recover from trauma. Try using these crystals while meditating. Hold them while you visualize the person you want to forgive. Imagine you hand them the crystal as a gesture of forgiveness. Picture that the crystal turns into a bird and flies away. Crystals remove blockages of fear and self-doubt to help us embrace our intuitive self. The best crystals to carry or to wear to increase our psychic abilities include apophyllite, labradorite, and moonstone. Moonstone will also help you accept your intuition. Shattuckite, azurite, and apatite help you develop your psychic abilities. Unikite will help you stay grounded while you’re working to open up to your psychic abilities. It isn’t necessary to follow all of this advice at once! Just choose one or two areas you’d like to improve, choose the one or two corresponding crystals, and give it a try. You’ll quickly begin to see results!